This is the kind of book that shows me I still haven't lost the ability to be shocked, and that my ignorance of the methods of racial suppression in this country remain vast. Definitely going to read this one. 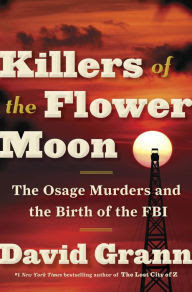 Btw, great Fresh Air interview with David Grann on 4/17/2017. So glad you will take a look at this. This is the history we missed as youngsters, and that is so terribly important to show us what not to do, but also to show us how far we have come. Heard the interview with Fresh Air and am pleased they spent the entire segment on this one book. There is lots to unpack.